One skier's ode to a mom-and-pop shop. They may not have the clout of the big ski regions, but they mean more to us than many a mega-resort. Small ski areas win us over in many ways: sometimes with plentiful snow, sometimes with terrain, sometimes just because they’re right around the corner. Whatever the particular perk may be, that trusted old atmosphere—the one that gives our days in the snow special meaning—stays the same. Robert Maruna experienced a few days like this during last winter’s modest winter at Loser, a gem of a mountain in Austria’s Ausseerland that’s rightly known as a powder haven. A Saturday morning in January 2017; Simon and I roll into the parking lot at Loser. I’m not sure if it’s my morning grogginess or the thick wall of falling snow, but I can’t see any more than four other vehicles around us. It’s snowed a good 40 cm overnight and the clouds are still shaking out their bounty. Coffee first, the lift doesn’t open for half an hour. We struggle into our ski boots, wind and snow whipping around our ears. It’s damn cold—a miracle that my car even started this morning. In the small bar next to the lift we’re given a warm welcome. The espresso tastes just like it should—not always the case in ski resorts outside of Italy. I watch the snowflakes through the window as they fall, and pray to god that at least the lifts underneath the tree line will open up. A quiet forest, untracked powder. Loser delivers. Loser—a 1838-meter-high mountain at the northwest point of the Steiermark region—benefited from more than a few healthy northern storms in 2017. By the end of the winter it counted among the snowiest regions in the Alps, which for Loser isn’t an exceptional feat. What luck, that this relatively quieter corner of the Alps happens to be one of my old stomping grounds. Simon shakes me out of my thoughts: the Loserfenster will stay closed, but Loserjet 1 and the Sandlingjet are opening up. 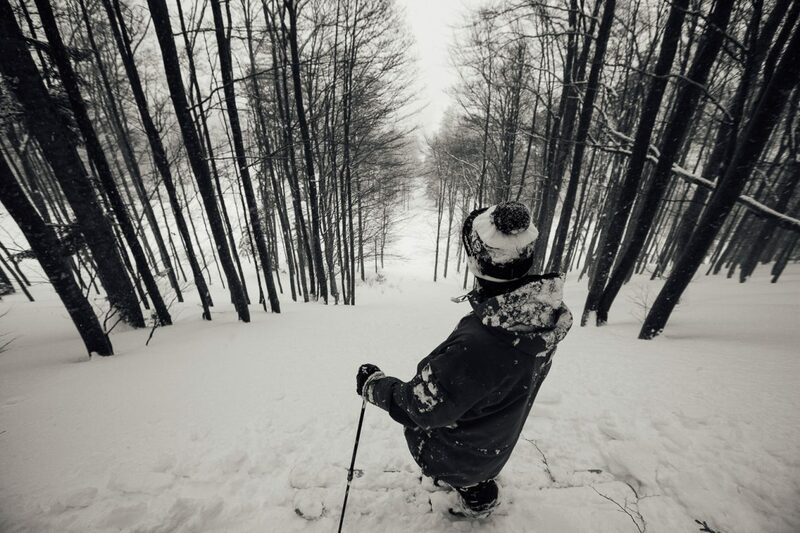 500 vertical meters of the finest tree runs, just for us! One of the reasons why I don’t have a steady job; not the worst reason either. At quarter to five we’re back at the car, the adrenaline still bouncing through our veins like Ping-Pong balls, laughing like little kids. We tank up on the drive home; diesel for the car and a double espresso for the driver to fight against the oncoming tiredness. Simon falls asleep after half a beer and I lose myself in my thoughts again. The snowfall has died off overnight and a Sunday-morning sun warms our tired bodies through the windshield as we pull up to the parking lot and the procedure begins again: boots on, find gear, pound down an espresso before the crowds arrive. The only surprise is that the crowds don’t arrive. Only the local crew around Sebastian Hirsche and a few scattered touring groups share the mountain with us today. The detachable chair of the Loserfenster glides uphill, while below us a view to make any snow lover’s heart beat faster opens up. Wind-lips as far as the eye can see, cliff drops without end, hip-high white gold glittering in soft light. Our chair arrives at the top station and the humming of the lift cable tears me from my daydreams. Now we face the choice: charging to the right into the steep bowl towards the reservoir, or taking a few mellow warm-up laps on the flatter terrain to the left. The only track leading towards the bowl has caused a large fracture and—since Simon and I have no desire to end up on the front page of the local newspaper—we decide to go left. Further memories are lost in clouds of spraying snow, and if Simon hadn’t been taking pictures, it could have been just another daydream. When we chase our dreams long enough, we’ll find a place where illusion and reality meet. Loser is one of those places. Despite just four chairlifts, two T-bars, and a thousand meters of vertical, Loser counts among the few hidden treasures of the Alps’ skiing geography. It’s always worth a visit; especially on the good days. More information at www.loser.at.